Missing even a single tooth can dramatically impact your oral and overall health, speech and chewing abilities, and self-confidence. 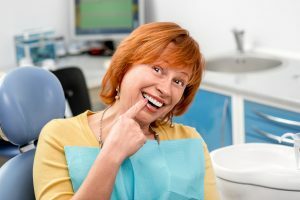 Unfortunately, traditional tooth replacement options aren’t always much of an improvement since they only restore the parts of teeth visible above the gum line. Dental implant supported tooth replacement is the only restoration option that replaces both the roots and crowns of lost teeth. Keep reading to find out why more and more dentists each year are recommending prosthetics supported by dental implants to improve quality of life for patients with one or more missing teeth. Dental implants are titanium posts that mimic the root structure of missing teeth. These posts provide adequate stimulation for the jaw and soft tissue, ensuring patients maintain youthful facial shape and volume. Additionally, tooth replacement prosthetics are solidly anchored to these implant posts creating a more natural looking, feeling, and functioning end result. Traditional tooth replacement prosthetics need to be refitted or replaced every five to seven years on average. Because the root structure of teeth is not restored, jawbone density and gum tissue volume are diminished over time. This changes the shape of the gum tissue, and replacement teeth need to be adjusted to match. This is especially true for removable partial and full dentures, which rely heavily on the shape of the gum line for support. Traditional dentures only restore about 20% of chewing function. That means denture wearers are significantly limited in the types of foods they’re able to eat. This limited diet can adversely impact overall health. Implant supported dentures renew chewing ability 70% or more in most cases. That means there are very few foods you can’t enjoy with a dental implant supported prosthetic. Missing teeth can make you feel less than your best. If you find yourself smiling less frequently or covering your mouth when you speak, it’s time to complete your smile. Dental implants fully renew the smile to full, cosmetic function. That means you can talk, smile, and eat in public with complete confidence. Dr. Yelena Obholz and her dedicated DC dental team are passionate about patient experience. We’ve learned, through years of tireless effort, that the best patient is an educated patient. That’s why we always take the time to answer questions and thoroughly explain all of your treatment options. Our website and blog are great resources if you want to learn more about the services we provide. You can also contact Aesthetic & Family Dentistry of Washington anytime with questions or to schedule an appointment.